Florida bound, F&M Baseball set off to the Sunshine State to reverse an early setback at the start of their 2017 spring season. 1-4 going into the NCAA DIII tournament in Auburndale, FL, F&M Baseball had nothing to lose as the underdogs of the tournament and proved to be such when they left Florida 9-1 for the week. Wins over Fitchburg State 6-0 and 13-4. Win over Stockton 29-15. Win over D’Youville 17-2. The Diplomats proved to be an unstoppable force on the field in the warm weather, but whether or not they could maintain this streak would be the real test when they returned to Pennsylvania. So far has looked so good for the Dips, however, after they faced off against Elizabethtown in their first game back from Spring Break. Bumping their record to 11-5 overall, F&M held the Blue Jays and clenched the 5-3 win this past Thursday afternoon. In a non-conference competition, F&M struck first in the bottom of the second inning. With back-to-back singles from F&M’s Kyle Ebert and Max Schwartz, F&M’s Zachary Robertson advanced the runners to second and third with a key sacrifice bunt. To add, F&M’s Kevin Lammers put the opening run in the books with a grounder to second that brought Ebert in to score the first run of the match. Pitching a no-hitter for the first three innings of the game, F&M’s Sam Ackerman was going strong until the Blue Jays caught up to the Dips with three hits that culminated with a two-out RBI, tying the game 1-1. At the top of the next inning, F&M broke the flood gates open with three runs on three hits, including a two-RBI double down the leftfield line from F&M’s first baseman David Iacobucci. Helping raise the score 4-1 in the Dips’ favor, Iacobucci came in clutch again in the seventh, increasing the Dip advantage to 5-1 with a shot to left center that resulted in a double and brought F&M’s Brian Meerholz home from third. Elizabethtown was not quite ready to give up, however. Adding two runs in the bottom of the eighth, F&M was pressured to put in their relief pitcher, Luke Bengal, who forced a fly ball to center field to end the inning. Ackerman earned the win after throwing five innings and allowing just one run on three hits. Four relief pitchers combined to finish out the final four innings for the Dips, allowing just two earned and striking out five. 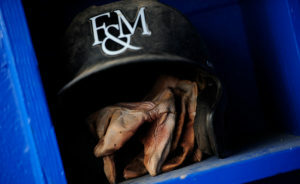 F&M’s Danny Blugis secured a Dip win by throwing a scoreless ninth inning. Overall, however, Iacobucci led the team with a 3-for-5 effort, clutching two doubles and three RBIs. Meerholz was 2-for-3 with two runs scored, and Swartz was 2-for-4 for the day. In another non-conference game this past Saturday, the Dips faced off against No. 17 TCNJ for a doubleheader which they lost in two tough contests. Playing strong, F&M Baseball continues to dive into the start of their season optimistic about the potential that lies ahead. Come out and support F&M Diplomat Baseball on Tuesday, March 28th against Messiah at Clipper Magazine Stadium.